Apart from the actual symptoms, the most alienating aspect of psychiatric drug withdrawal is the invalidation by the medical community. I spent much of 2012 – the year I hit tolerance with benzodiazepines - visiting my doctor, knowing something was wrong and suspecting the medication, only to be encouraged to pursue other – more well known – avenues of treatment. 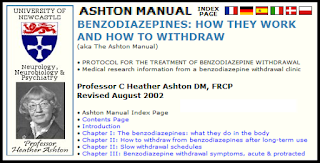 The key discovery at the time came when I stumbled on the Ashton Manual – the online guide to benzodiazepine tolerance, withdrawal, and discontinuation. Written by a neurologist with impeccable credentials, Dr. Heather Ashton spent years running a clinic for people trying to get off the drug. Her clinical description of symptoms associated with the medication, tolerance and withdrawal, mirrored my experience. It was the first time I felt like I wasn't descending into insanity. But despite the nearly unimpeachable rigor of the manual and the ubiquity of benzodiazepine prescriptions worldwide (xanax is the number one most prescribed drug in the US), my physician had no knowledge of the manual or the syndrome and neither did most other established healthcare sources I pursued. Her research and methodology, however, was unimpeachable and my doctor was willing to go along with her tapering protocol after I showed him the manual. Her manual gave me a modicum of legitimacy in my attempt to convince my doctor that I was having a PHYSICAL reaction and my symptoms were not a manifestation of a "mental health disorder." When you get off the main road of established medical conditions and treatments like I had to do with psychiatric medication withdrawal, you find yourself in a dense forest of uncertainty. The online community of alternative medicine and support groups for benzodiazepine and SSRI withdrawal in general is a living embodiment of the wild west. There are no rules. Because of the dearth of research into drug discontinuation - what you encounter for coping strategies is anecdotal and often times contradictory. What I wanted more than anything were more voices of medical credibility to back up the Ashton Manual. Heather Ashton for all her brave work, did not create a movement or get heavily involved in advocacy. She also doesn't seem to have too many other colleagues in the field who have studied the long-term cognitive effects of benzodiazepines and the drawn-out symptoms some people encounter when they get off. So who do people turn to for legitimacy when trying to get awareness and acceptance of this phenomenon? Fortunately, there is a burgeoning psychiatric reform movement with compelling voices, led by serious professionals like Robert Whitaker (an independent journalist who has uncovered an amazing amount of data that throws cold water on the efficacy of psychiatric medication), Peter Gotzsche (an internal medicine specialist and expert in clinical trials and the drug industry), and David Healy (a psychiatrist who runs an excellent prescription drug database and advocacy site RxISK). Those three alone have helped build a grassroots campaign questioning the validity of psycho-pharmacology. Many other mental health care specialists and former patients have joined them in advocacy for reform and awareness of the harms of psychoactive drugs. 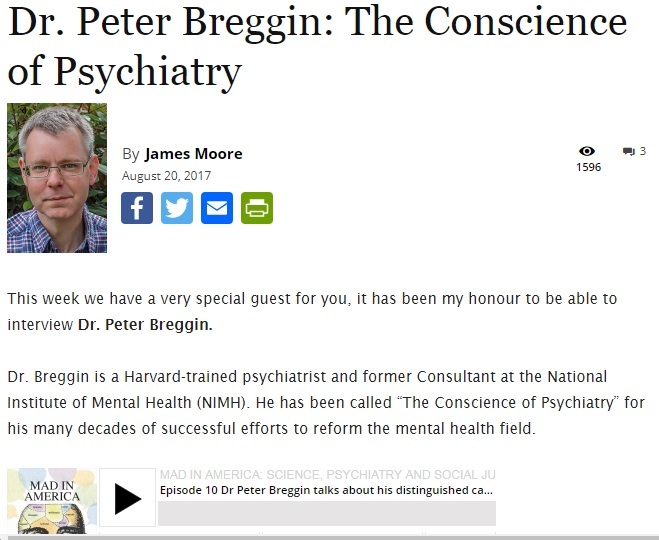 The Self-Described "Conscience of Psychiatry"
And then there's Peter Breggin. Breggin is a psychiatrist and a long-time critic of biological psychiatry and the medical management of mental health care. He has for decades railed against medicating people with mental health issues and criticized essentially all psychiatric drug use. 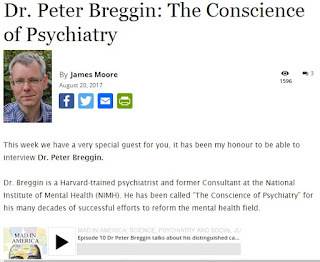 Frequently cited by psychiatric reformers, Breggin's adoration often approaches patron saint status – something he seems to relish as he refers to himself on his weekly podcast as “the conscience of psychiatry.” That he was an early critic of psycho-pharmacology definitely plays into this unquestioning respect. But this is not a man whose background is entirely credible and who has made questionable choices in the way he spreads his message. 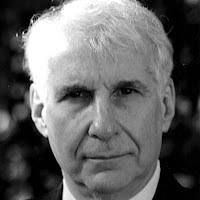 What motivated me to write about Breggin and how his specter haunts me is the manner in which grassroots critical psychiatry organizations like Council for Evidence-Based Psychiatry (Dr Gotzsche's advocacy organization) and Mad in America (Robert Whitaker's well-known grassroots web page) unquestioningly embrace him. But it only takes a quick look at Breggin's career path and associations for me to feel completely uncomfortable with those organizations putting his face on the front of their web pages and trumpeting him as a legitimate medical authority. Just enter “Peter Breggin” into Google and count the crazy. Breggin has not just made one or two appearances on the program, he has his own link on the page as a recurring guest. Program titles he's been a guest on include “Psychiatric Drugs/UFO Disclosure”; “Supernatural Realms & Psychic Work,” “Satanic Ritual Abuse,” and “Advanced Beings and Reincarnation.” His portion of the segments are grounded in his work and criticism of psychiatry, but the surrounding content is literally not of this earth. The crazy takes a more pernicious turn when you discover Breggin is also a frequent guest on the Alex Jones Show. A vile and grotesque demagogue, 9/11 truther, Sandy Hook skeptic, armed militia supporter, and friend of illuminati wackadoodle theorist David Icke, Alex Jones and his show mines the most paranoid conspiratorial theories, actively encouraging its listeners to buy survival kits for the upcoming apocalypse as well as hatefully endorsing President Donald Trump's most racist elements. In a June 27th 2014 appearance, Breggin and host David Knight spend a good 20 minutes in a froth over fears of the government inserting brain chips into the populace. The kernal of truth in the segment is a project by the Defense Advanced Research Projects Agency (DARPA) to record and stimulate brain activity in veterans with issues related to PTSD. It's not nearly as Orwellian it sounds either as it incorporates Deep Brain Stimulation technology which is already a common and popular form of therapy for treatment of neurological conditions like Parkinson's and dystonia (a movement disorder). But to hear Breggin and Knight opine about it, it's the next step before being assimilated by the Borg. And if that isn't enough, Breggin is a frequent guest of the unhinged, hateful right wing radio personality Michael Savage's show. You may remember Savage from several years ago when he created an uproar claiming that autism was a fraud and that, in 99% of the cases an autistic child is a “brat who hasn't learned to cut the act.” The widespread revulsion of the comments resulted in Savage's nationally-syndicated program losing sponsors and getting picketed by parents groups. But it certainly isn't too objectionable to Breggin. I mean never mind that if it weren't for the gains of progressives, Breggin wouldn't have the ability to access government and corporate records that he uses when he's tasked with being an expert witness in litigation cases against pharmaceutical companies. He certainly wouldn't have the legal avenues open to him for his litigants to pursue wrongful death lawsuits, a lucrative money making avenue of his career. But beyond even that, his gross caricature of progressives as eschewing personal responsibility and likening them to children is so simple-minded and naïve that I can't imagine how he's ever been able to convince anyone of anything. Dr. Breggin has been at this a long time. That could be part of the attachment to him – he was making these arguments before Robert Whitaker, before Marcia Angell, and the Kirsch Study. Perhaps Whitaker, Gotsche and others feels a debt of gratitude to Breggin for paving the way and getting many things right about the dangers of psychiatric drugs decades earlier. But I still think it's worth debating. I tried pointing out my reservations about Dr Breggin in the comments section of his youtube video in Mad In America. I cited the frequent guest appearances on Coast to Coast and his June interview on the Alex Jones Show. I definitely expected some blowback from other commenters, but I did not expect the site to remove portions of what I wrote. Just 12 hours after writing my concerns about him, however, I got an email from the Mad In America website moderator informing me that two comments I made were being removed. One of the objectionable remarks I made was “Breggin has a relationship with Scientology.” Technically, that's not accurate. Breggin HAD a relationship with Scientology when he worked for the Citizens Commission on Human Rights (CCHR) – an organization created by the Church of Scientology to combat psychiatry and psychiatric medication. He stopped working for the organization in the 70's and completely disavowed Scientology not long after. But CCHR still disseminates his work and criticisms (most likely against his preference) and so it's easy make the assumption of a connection. And that's the mystery in a nutshell. Does Mad In America and the Council for Evidence-Based Psychiatry not know that the person they promote on their web site airs his views on shows so easily dismissed by rational people? Is accurately pointing that out "dragging him through the mud"? I am more of a “victim” of psychiatry than he ever will be (in fact, he's benefited a great deal from psychiatry when you look at his paid efforts of criticism), yet I'm the one being censored for voicing uneasiness with his vaunted status. Why is the psychiatric reform movement trumpet this guy so readily? How can such a movement engage in dialogue with the established mental health world, when one of its most-promoted figures so effortlessly associates himself with crazy and intolerance? This seems maddeningly self-defeating for a movement that desperately needs understanding and awareness. If I had used Breggin as my source rather than Dr. Ashton's, how seriously would I have been taken? It's not an academic issue for me. But I feel like I'm the only one. And I don't understand it. Where are the people - those fighting for acceptance, awareness and more research into this field - vigorously objecting to the inclusion of Peter Breggin as a reliable and legitimate authority? When I was at my worst and there was simply no where to turn for support and understanding, I doubted myself. If this isn't a real condition– I thought – then I'M the problem. I'm too weak for this world. There is no one here to back me up, to take the burden of responsibility off me, to say that this is not my fault. I wanted research that proved what I was going through was not a personal failing, but a genuine medical phenomenon from taking benzodiazepines and SSRIs as prescribed by a doctor. I wanted credible, sensible voices whose work I could share with the physicians and counselors I was going to for help. And so have scores of people before me, scores of people right now trying to work with their doctors for help, and scores of people who have yet reached tolerance. There is so little out there in the mainstream medical world validating this experience that isolated me and many others. So much is unknown because the research is lacking. So much still needs to happen for this condition to be accepted and understood. It's not that the numbers of people suffering what I've gone through are dramatic, it's that the experience for those who do suffer from it is so traumatic and disabling that many resort to suicide. I know this for a fact because no fewer than three people I encountered on message boards and support forums took their lives while I was frequenting them. So this is the place I'm coming from when I raise this case about Dr Breggin. I personally feel that his poster-boy status is harming those of us fighting for awareness and legitimacy and I genuinely want a dialogue on this so I can either understand why he's so prominently featured or plant seeds of concern about him and the questionable baggage he carries. You never updated if you tapered off benzos. I have a story basically the same as you including smoking pot and getting DR/DP for days after. Then latter panic, then zoloft and xanax, then lexapro and klonopin. Plus Akathisia 4 times and not knowing what it was. I am off all meds been three years. I micro tapered the benzo reducing .001mg a day. Klonopin goes into whole milk (soluble in the fat of the milk) and tiny reductions help to not shock the brain. I wish you the best. we are all wondering around trying to avoid this from happening again so far Doctors won't help.